This review first appeared in the January 12, 1996 issue of the North County Times. The hip-hop and rap influences at the heart of the acid movement are the best things that could have happened to jazz. Acid jazz is really hot in England right nwo, and a new distibution deal for Acid Jazz Records has brought some of the best examples of the British school to stateside listeners. 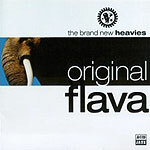 The Brand New Heavies' debut is one of four CDs recently issued in the U.S. by Acid Jazz  and displays a funky yet relaxed beat with swirling, serpentine themes. Somewhere between the sounds of Sade, Wather Report and the Ohio Players, "Original Flava" undulates with joy and sensuality. This is a more vocal-oriented soudn than many other acid jazz combos. While the instrumental improvisation (the heat of what makes jazz jazz) remains, there is a sultry element brought on by the Anita Baker-like vocals of Linda Muriel.